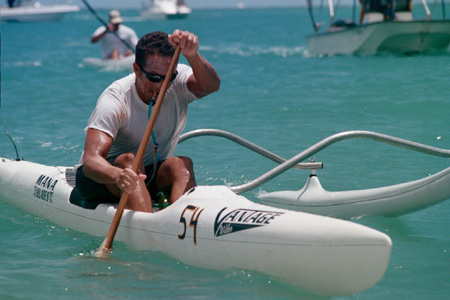 Coming back strong from his 2002 season ending ankle injury, Aaron Napoleon made some OC1 history by beating everyone including kayakers to the finish line in the Oahu Championships. In the process he outpaddled Karel Tresnak Jr who had a streak of seven OC1 open wins to his credit. The Advertiser photo below said it all but he recovered quickly in time to watch Nappy come across first in his division as well. The races also saw the emergence of Mike Silva as a dominant force in the short course events as Mike led everyone else to the finish several times including the big one in the State Championship race. 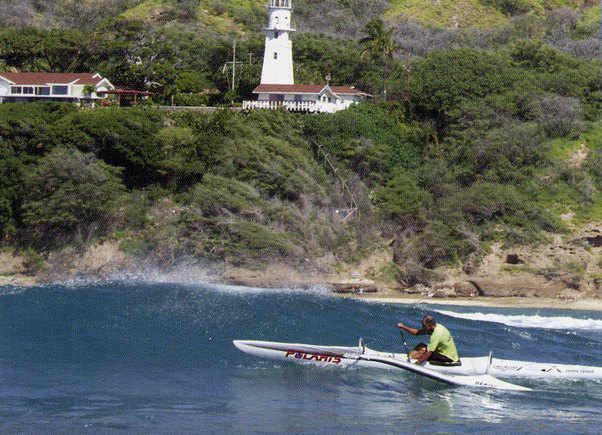 Mike served notice for next year long course races as he paddled a very strong solo Molokai finishing12th overall. Mike Hangai was a consistent finisher high in the long course races along with new papa Norm Bradley. Aaron and Kai Bartlett repeated as Kaiwi Relay champs leading a big field to the line and also took the title on Kaua’i in the Kaua’i World Challenge. 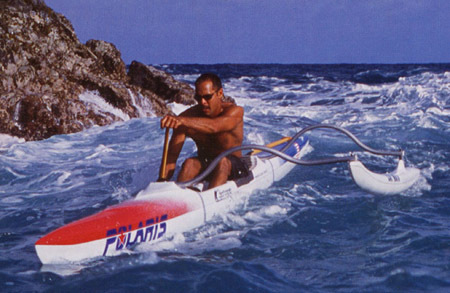 Silva smokes around the buoy…..and powers to the finish in the solo. Ironman Races With a race almost every weekend beginning in April, Anuenue’s paddlers were definite regulars on the circuit. The GM men and mixed crews had their big moments while an up and coming group of Novice men got their paddles wet improving each race. At the mid season point, Anuenue could look back on three out of four “A” Division regatta wins The stars were the keikis again both boys, girls plus mixed 12 crews, and a Novice B group that was a consistent high finisher taking home two golds and a silver.GM women, men, mixed 55 and open four combimations were also contributing points. 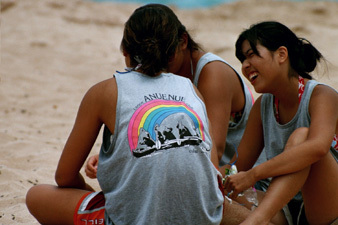 These same crews continued to do well and gave the club a solid second in the Oahu championships. Qualifying nine crews for the States at Keehi Lagoon, Anuenue finished in the top ten in 8th place overall in a very competitive “AA” division. The mixed 12 crew came the closest to a medal finishing fourth, and the Novice B and open 4 crews raced well in their events. 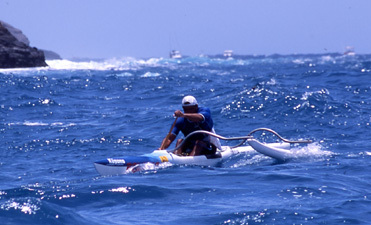 Three men’s crews, (open, golden masters, & novice) participated in the majority of the pre-Moloka’i long distance races. In addition, the GM crew made their annual visit to Catalina and also raced at Kona as a 60+ crew (second) and double-hull (first -with some Big Island help). An enthusiastic group of novice women also raced in the wahine events getting ready for their first Na Wahine competition. All three men’s crews raced well with the open crew leading the way finishing 18th overall (5:30:18). 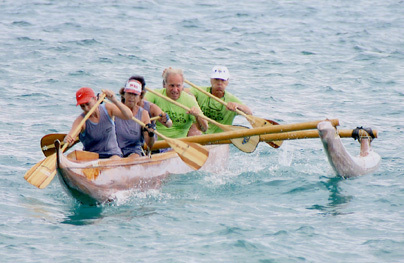 Finishing second in their division to rival Kailua, the GM crew came in 67th overall (6:19:47). The novice crew was close behind in 6:24:37. In the Na Wahine, race, the women’s crew crossed the line with big smiles in 6:41:43.